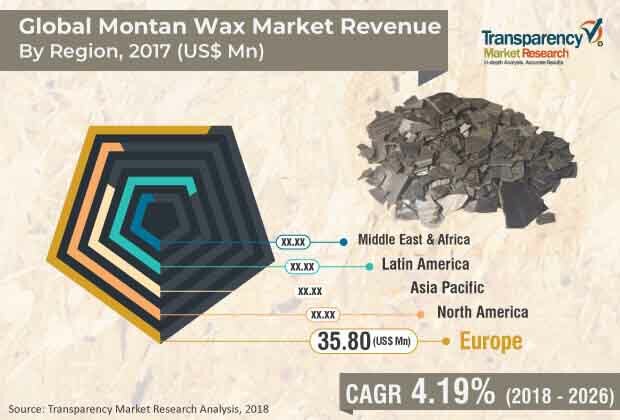 According to a new report ‘Montan Wax – Global Industry Analysis, Size, Share, Growth, Trends, and Forecast, 2018–2026 published by Transparency Market Research (TMR) , the global montan wax market was valued at US$ 118 Million in 2017 and is anticipated to expand at a CAGR of more than 4.0% from 2018 to 2026. Rise in demand for plastics is driving the global market. In terms of value, the market in Asia Pacific is anticipated to expand at a CAGR of more than 4.0% during the forecast period. Montan wax is designed to withstand severe operating conditions as well as environmental impacts. Increase in usage of montan wax in coating agents is estimated to propel the montan wax market during the forecast period. Demand for montan wax is rising, as it constantly delivers outstanding performance and benefits in the coating agents segment. Montan wax is widely used as coating agents in automotive coatings, furniture coatings, and fruit coating. The lubricants segment also holds significant share of the global montan wax market, as this wax is used as lubricant in various machinery and plastic processes, especially for engineering plastics. Montan wax is primarily used to polish various objects such as floors, furniture, leather, and cars. Depending upon the requirement of applications, the wax product can be formulated as water-based, water solvent-based liquid, gel-like wax, or solid dispersants. Montan wax possesses properties akin to carnauba wax. It can be used in place of carnauba wax, where the focus is not on the color. Montan wax is darker than carnauba wax. Based on region, the global montan wax market has been divided into North America, Europe, Asia Pacific, Latin America, and Middle East & Africa. North America and Europe hold major share of the global montan wax market, as most of the crude montan wax is produced in these regions. Europe constitutes significant share of the global market. Rise in use of montan wax in developed economies such as Germany and Russia & CIS is projected to boost the market in Europe during the forecast period. The montan wax market in Asia Pacific is estimated to expand at a moderate pace during the forecast period, due to the presence of montan wax ores in China. China is the major producer and consumer of montan wax. The montan wax market in Latin America and Middle East & Africa is likely to expand at a sluggish pace in the near future. Key players operating in the global montan wax market include ROMONTA GmbH, Clariant, Mayur Dyes & Chemicals Corporation, S. KATO & CO., Yunphos, Poth Hille, Frank B. Ross Co., Inc., Völpker Special Products GmbH, FIRST SOURCE WORLDWIDE, LLC., AmeriLubes, L.L.C., Carmel Industries, Parchvale Ltd., MÜNZING Corporation, and ALTANA. These companies engage in acquisitions and joint ventures to enhance their market position.